Interior Design, Weddings, Family Pet, Book Cover, Licensing etc. If you would like to contact me about commissioning a piece of artwork either for yourself, a loved one or a business, please get in touch here and just give me an idea of what you might be interested in. From there, I will contact you and along with asking more questions about what you have in mind, I will also provide you with an approximate price/time etc. I then take a deposit of 25%. If you live nearby, I am happy to come and visit you where we can chat about your requirements in more detail, take photos, notes, sketches etc. Should you live further away or even in a different country, I am available to share preliminary sketches, ideas, colour themes and progress photos via email or Skype (if required) at key points. I am fairly flexible in the style and medium of artwork that I can create for you - I love to work in mixed media, acrylic, watercolours, oils or pastel (dry and soft). 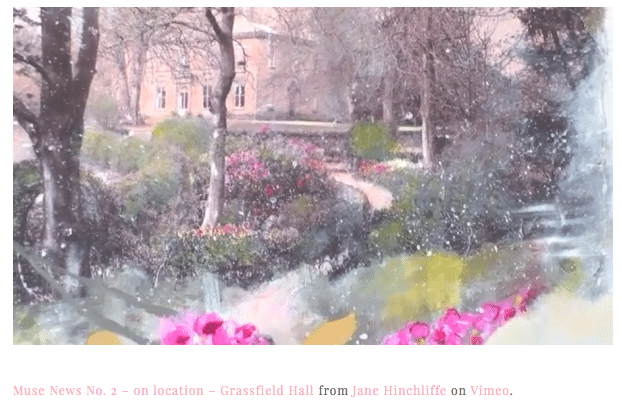 Below is a video I filmed recently where I talk a little on the process of my most recent commissioned rtwork undertaken for Lisa and Alex from Grassfield Hall - a Luxury Bed + Breakfast, located in Pateley Bridge, Harrogate, North Yorkshire. Below is the final piece that I was asked to complete for Grassfield Hall, along with a close up. I had an idea that I wanted a piece of artwork for the house that we were restoring but I knew it had to be unique to the house, incorporate its fascinating history and perhaps even tell a story. I don’t consider myself to be a creative person, so even though I had this idea, putting together a plan could have been difficult but then I came across Jane Hinchliffe’s work and instantly loved it. The artwork that I had seen had pieces of text hidden within in, was dreamy and slightly abstract which appealed to me as it would suit the room in which it would be placed. I explained my vision to Jane and she set about putting some ideas together. She had the idea of including some photographs taken by Amy Collins who lived in the house in the early 1900’s and using the scripture that I liked so much within the picture to explain about Amy’s life and her family. I instantly loved the rough drawings that she had done but was also quite amazed by her interpretation of what I had said that I wanted - it was as if she had read my mind and completely understood what I wanted! 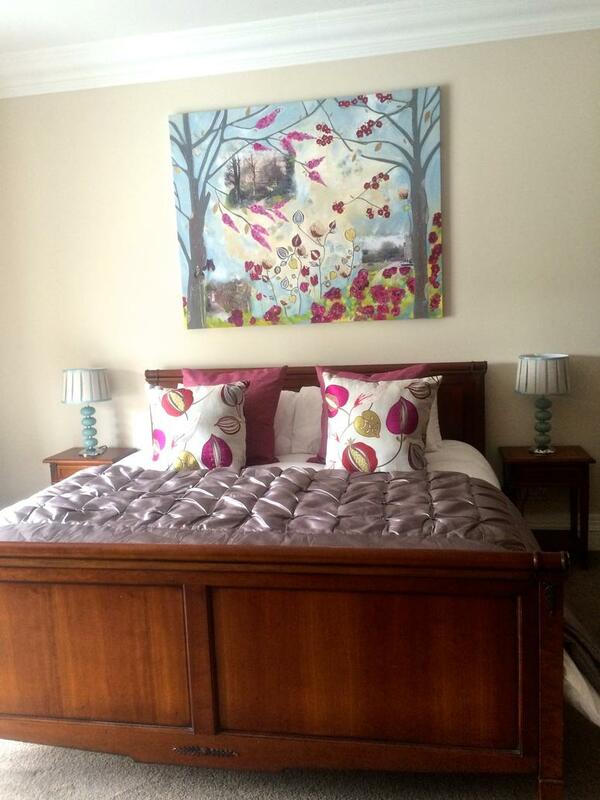 What a lovely addition to your child's bedroom - a personalised piece of art. Truly, a wonderful gift from a parent, grandparent, godparent, aunt or friend etc. I love working on Artwork Commissions because I get to work closely with the client and bring to life their vision - it's a magical process and such a privilege. Why not commission your very own family pet portrait with a personalised watercolour painting? Possibilities could include your beloved dog, cat, horse or even donkey (awww, love them). I also welcome any inspiration ideas that you may have such as photos, pinterest board examples, links or magazine images etc. To give you some idea though of my work thus far, please visit my licensed artwork page and/or shop. Remember, I want you to be 100% happy with your bespoke piece of artwork, so please give me your genuine feedback. If your 'vision' gets clearer as we go along - stay connected with me and don't be shy in sharing. Lastly, please remember that 'nearly' all commissions can be changed (within reason).